Blow out the eggs as shown in the tutorial above. Wash them out and let them dry. Fill a disposable plastic cup with lukewarm water. Pour nail polish on the water, going back and forth to create lines. Start with the blue and purple, and end with the black nail polish. Wearing a latex glove, hold the egg at the top and bottom and quickly dip it into the water until it's fully submersed. Pull the egg out and set it on an aluminum foil lined baking sheet. Sprinkle fine silver glitter onto the wet nail polish. Allow the egg to dry for 6 to 8 hours. 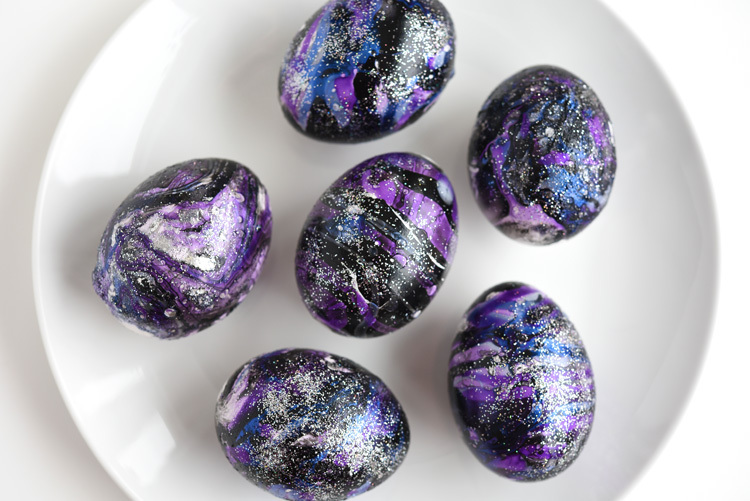 These eggs are decorative only. Do NOT eat them.